Belina's Adventures: Do you know about Farro?.... If you do, then you must love it! If you don't, you're in for a treat! Do you know about Farro?.... If you do, then you must love it! If you don't, you're in for a treat! I've been working with alternative grains as they've been put on the forefront with the "Farm to Table", "Slow Food" and Organic Food movements that are the trend now and I must admit that although I was familiar with many of these grains, like: Amaranth, Quinoa, Couscous, Barley, Ragi, Teff, etc. (there are a lot...) but it had been some time since I had actively used them. Back then during my Idyllwild Health Food Store & Restaurant days, there were daily items.... I'm glad to see them make such a big comeback. 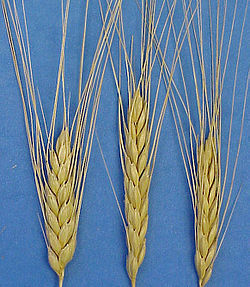 A most important detail that come into being with many of the alternative grains is the fact that a lot of them also happen to not be wheat related and have no gluten, so for those of you with either wheat or gluten sensitivities, you can indulge, get all the great nutritional values they offer and be "with it" at the same time. Pretty great, heh? I also like the fact that most of us stay with our old set of grains and starches and don't think outside the box, which puts us in a rut and you know what I think about ruts..... so let's shake things up and bring some new friends to the party.... today it's all about FARRO. make a polenta type food as well. The French decided to revive it and so begun to supply elegant restaurants with the grain to be used in soups and other dishes so it had a resurgence and now many other countries are re-discovering it. Mediterranean Style Farro Salad.- Lovely colors and amazing taste, this can be either a main dish or a creative side dish anytime! In a mediumsaucepan, combine 4 cups of water with the farro. Bring to a boil over high heat. Cover and simmer over medium-low heat until the farro is almost tender, about 20 minutes. Add 1 1/2 teaspoons of the salt and simmer until the farro is tender, about 10 minutes longer. Drain well. Transfer to a large bowl and let cool. Meanwhile, bring a medium pot of salted water to a boil over high heat. Add the green beans and stir. Cook for 2 minutes. Transfer the cooked green beans to a bowl of ice water and let cool for 2 minutes. Drain the green beans. 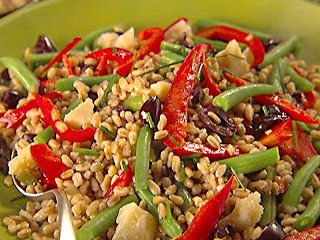 Once the farro has cooled add the green beans, olives, red pepper, chili strips, Parmesan, and chives. Stir to combine. In a small bowl mix together the sherry vinegar, olive oil, mustard, pepper, and the remaining 1/2 teaspoon salt. Stir to combine. 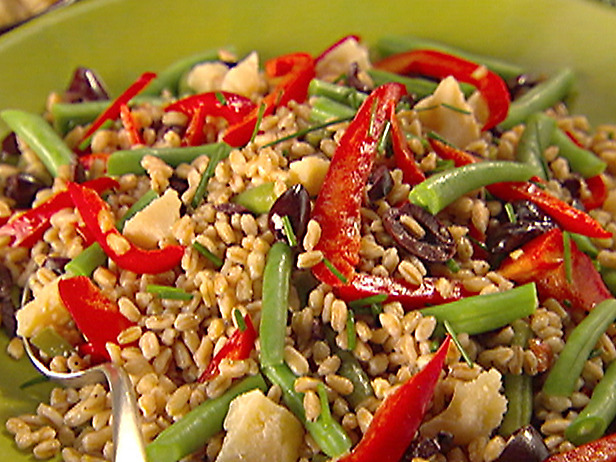 Pour the sherry vinaigrette over the farro salad. Toss to combine and serve. 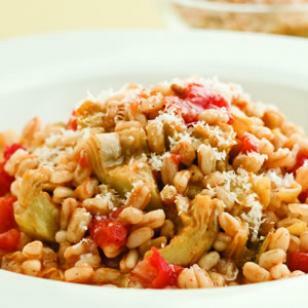 Farrotto with Artichokes.- Just as smooth and lovely as Risotto but with Farro, just as flexible too! .Heat oil in a large saucepan over medium heat. Add onion and cook, stirring, until soft and beginning to brown, 3 to 5 minutes. Add garlic and cook, stirring, for 1 minute. Stir in the farro, tomatoes, artichokes, basil, salt, pepper and crushed red pepper .Add 1/2 cup broth (or water), bring a boil over medium heat and cook, stirring, until most of the broth is absorbed. Repeat with the remaining broth (or water), adding it in 1/2-cup increments and stirring until it’s absorbed, until the farro is creamy but still has a bit of bite, about 10 minutes total. Stir in 1/4 cup cheese and lemon zest. Serve sprinkled with the remaining 1/4 cup cheese. NOTE: For all recipes you'll notice there are some canned items used, I have included these to make the recipes faster for many of you while at home we don't use any cans at all, but I know not everyone will take as long to produce meals as I do so it's cool. Also, I use fresh stocks made early in the day and which I always keep on hand to save time, purchasing whole chickens, etc. and butchering them at home. I know buying pieces is easier and purchased stocks are good quality, so use whatever is convenient for you, ok? I do hope you will try and enjoy some of these alternative grains, I'm sure you will like them. Most places now have them available so they aren't as hard to find and if you can find them sold in bulk, so much the better. You can also try making some of your favorite recipes and substitute the new grains in them and see the difference between the two. As always, you'll start to see the possibilities as soon as you work with them. Enjoy!